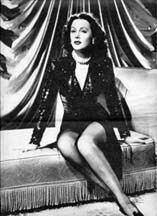 Hedy Lamarr: actress, pinup "girl," and, oh, yeah, inventor. Is there glamour in science? The answer to that question depends on what you mean by "glamour." Do we get to dress up in clicky heels and walk red carpets? Well, we can do the heels, sure, but red carpets aren't a frequent feature in the life of most scientists, unless you count that horrible red patterned stuff conference hotels seem to like so much. Do we travel the world? Sure--see "conference" in previous paragraph. Our conferences can take us to places we never might have gone were it not for our abiding interest in stars or fruit flies or the finer points of protein signaling. If you're the kind of scientist who does field work with hyenas or needs samples from Antarctica, then your travel can be even more exotic. Do we, like actresses or singers or Kim Kardashian, get to spend our days doing what we love, bringing IT to the world? Hell, yes, we do. Heels (optional), travel to far-flung locations, passion for what we do, bringing IT. Yep...there's some glamour in science. And you know what? I'd hazard that while we're doing it, we're feeling "beyond empowered." Glamour is a magazine that translates style and trends for the real lives of women. Our award-winning editorial covers the most pressing interests of our 12.4 million readers: from beauty, fashion and health to politics, Hollywood and relationships. We’re often optimistic, always inclusive, beyond empowering and can always separate the Dos from the Don’ts. Our readers live for fashion, live for beauty and most of all, live for Glamour. 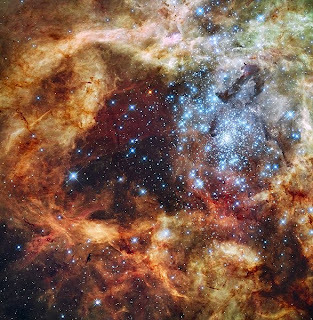 A stellar nursery in our intergalactic neighborhood. 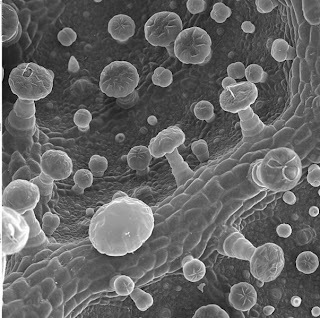 Scanning electron microsope image of the lower surface of a leaf from a black walnut tree. 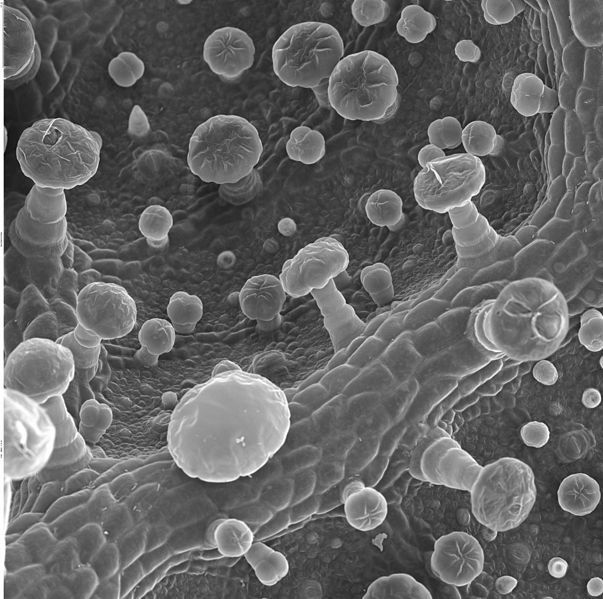 Scientists are the explorers, the discovers, and the investigators...and sometimes, their work becomes art. Given that science can be so glamorous, so beautiful, so empowering, you might think that the editors of Glamour, which offers its readers all three, might have included a scientist in its "Women of the Year" awards. That is not to diminish the fabulous, empowered women they did include. Gloria Steinem? Check. Gabrielle Giffords? Oh, yes. The beautiful, gutsy, empowered Esraa Abdel Fattah? Yes, and thank you. Arianna Huffington's there...although I find what her HuffPo Website countenances for health--including women's health--sometimes less than empowering. There's an artist, there's a fashion designer, there's...um...Laura Bush and her daughters and...J. Lo. Lea Michelle, a grown woman and another Woman of the Year, is depicted chirpily exclaiming that "I would be happy to be a high school student forever." It's a mixed bag. But in that bag, search as you will, you will find no scientists. Women who live glamorous lives, traveling, engaging, empowered and empowering. Women like Mireya Mayor, who despite her walking the walk in Pink Boots and a Machete, despite identifying a new species of lemur (video), despite her high-profile as an explorer and on television, does not fit the bill for Glamour. One reason you find no scientists is that Glamour doesn't seem to have a "Woman of the Year" category that includes science. They've selected some women who truly are inspirations, some that make you think, "Whuh?" (Kim Kardashian as "Entrepreneur of the Year" for UK Glamour comes to mind), and even some girls. Kardashians not withstanding, when Amy Poehler makes a list like this, you've got to give the editors some credit. So, I ask. Can the editors at Glamour give women in science some credit, too? Women like Elodie Ghedin, 2011 Macarthur Fellow and virologist whose work directly addresses critical public health issues? Or Ada Yonath, who was awarded the 2009 Nobel Prize in Chemistry for working on that tiniest of cellular structures, the ribosome? Or Elizabeth Blackburn or Carol W. Greider, who received the Nobel Prize in Physiology or Medicine in 2009 for their work in unlocking some of the secrets to aging? Or Susan Niebur, former NASA astrophysicist and four-time breast cancer survivor who has worked tirelessly while fighting inflammatory breast cancer to promote breast cancer research, awareness of inflammatory breast cancer (the cancer that kills without a lump), science outreach, and women in science? Glamour editors...women need science and girls and women need inspiration from scientists. Your list of "Women of the Year" includes women who are enormously inspirational and who have done immeasurable good for women. For 2012, please consider that women scientists fit that definition, too, and can also bring the glamour of passion and empowerment to your readers. Those 12.4 million women will thank you. Quantum Physicist Renate Loll - she totally rocks! Maybe not in their Women of the Year, but they have had a Science and Technology category in their 30 most powerful women list: I think Lucie Green topped it this year, and I did last. What they don't do is talk about the science that goes with it - unlike Vogue where Molly Stevens got a good opportunity when she was featuredearlier this year. So yes, Glamour has a long way to go and I wish they'd seize the opportunity. Reaching out to their demographic could be so powerful - and beneficial. 2. But is Ada Yonath? She's not particularly glamorous, and, according to many within the ribosome community (as well as out of it) shouldn't have been part of that Nobel prize. But I definitely see your point, and a beautifully written post. @Lil Peck: Duly noted, and agreed. @Athene Donald: I wonder if that's a list specific to Glamour UK? I checked around and think it may be, which of course brings up a whole set of questions about why the difference between publications. Are US women considered less...able? Interested? I did find a few links to your own listing, including this one. Congratulations. @katie PhD Thank you for noting the inclusion of Felisa Wolfe-Simon. As you say...that's a controversy there. Regarding Ada Yonath and her glamour--?? Madeleine Albright had been on Glamour's listing, which I assume had a whole lot to do with her successes and contributions, as well. I included Yonath because her work with antibiotic mechanisms would be, I think, relevant to women on many fronts. I was not aware of the controversy about Yonath's inclusion in that Nobel. I did know of the controversy--not a new one to the Nobels--of someone's having been left out, e.g., here, but I can't find links detailing controversy over her specific inclusion. If you have some, could you post them? Many thanks, and thanks to all for commenting. I'm sure that's a huge disappoint for him. The three-person limit is awkward in this age of global collaborations. Here at Future-ish we're making efforts towards addressing this in fun, positive ways. We have a growing list of Glamour Geeks (not all scientists but promotors of STEM for sure) and we just published our first ever Stylish Scientist List (both women and men on the list). Some people are making fun of it but we've had more folks that are supportive. We look forward to adding more folks to both in the future.